The ultimate long-cast spinning reel. Features Daiwa's revolutionary Long-Cast technology; exclusive worm gear for perfect line winding; 3 stainless steel bearings; aluminum spool; super-smooth drag with oversized felt/stainless discs and precision click adjustment; SiC line roller; and Lifetime Bail Spring. Right- or left-hand retrieve. "One of the best reels I have ever used! I have owned the 1600 for the past 6 years, and have it paired with an offshore angler powerstick (10-20#). I have abused this reel and it has survived some of the harshest fishing environments I can think of." "I've had this reel for 2 years now. I fish the West coast of Florida for Redfish, Trout, Snook, Sheepshead and more. this reel as others have said, may not be the smoothest reel on the market." 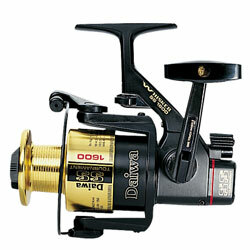 "I was a member of The Daiwa Pro-Staff back in the late 70's when the SS reels were first introduced. Well here it is about 30 years later, and I still use the reels that I got a year that they were available to the public." "I found one of these Diawa SS reels when I was about ten or eleven years old on a small mouth fishing trip in Illinois it was stuck in the muck nothing but the tip of the rod showing I am 23 now and this reel is still rocking."